‘I thought anenomes were spring flowers’, said my friend. ‘Yes and No,’ I started, but my friend deserves a considered response, although he probably didn’t expect the following! 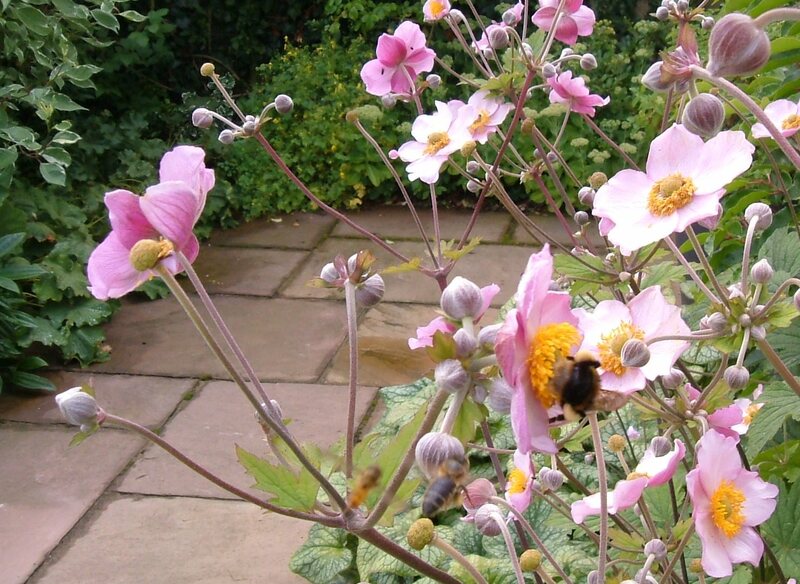 This wonderful perennial has the RHS Award of Garden Merit. The spring leaves are deeply veined, the buds entice in June and July, the flowers are beautiful in August and September (and drive the bees crazy! 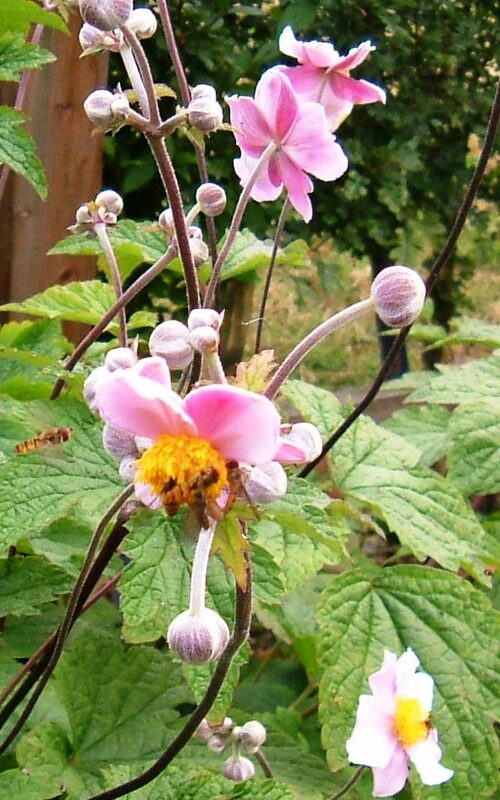 ), and the flower heads are striking in the autumn – what a generous plant! It belongs to the Ranunculaceae family – ‘.. is a family of about 1700 species of flowering plants in about 60 genera, distributed worldwide. 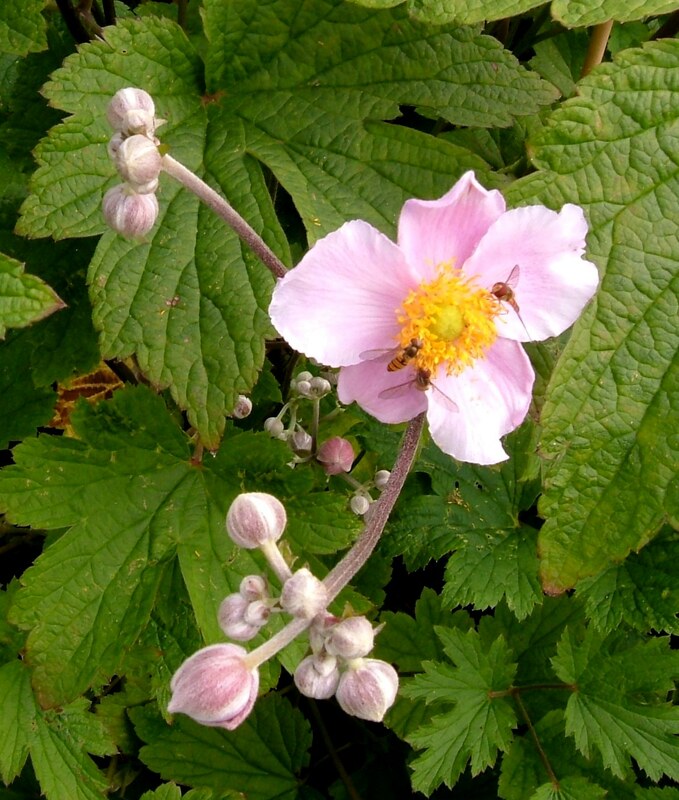 The largest genera are Ranunculus (600), Delphinium (365), Thalictrum (330), Clematis (325), and Aconitum (300 species)..’. 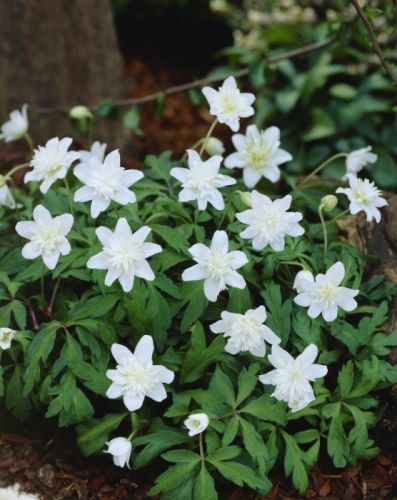 The anenome ‘..a genus of about 120 species of flowering plants in the family Ranunculaceae, native to the temperate zones..’. 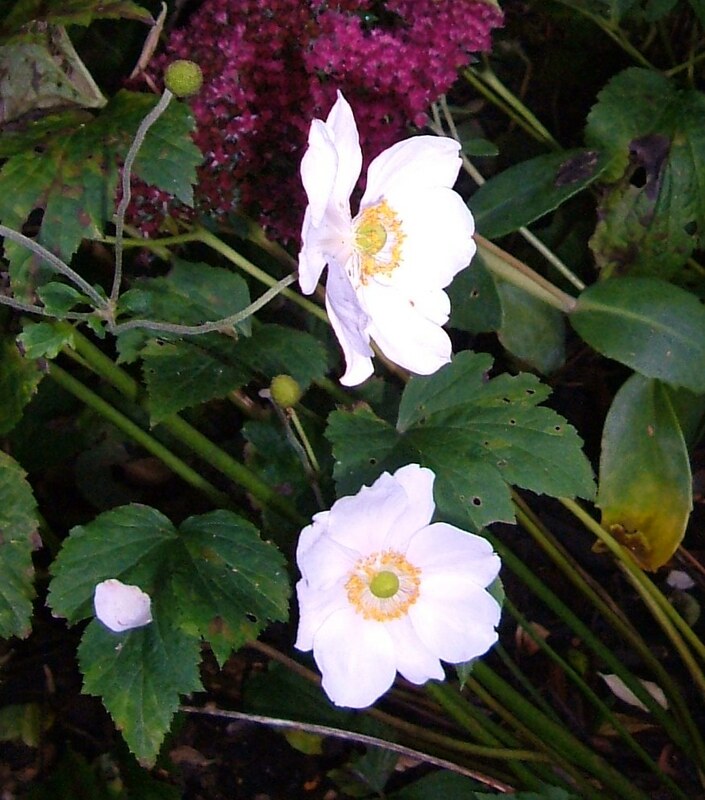 And then there is Anenome x Hybrida: ‘..Also filed under the name of Japanese anemone is A. x hybrida, first found growing at the Chiswick Garden of the RHS in 1848. 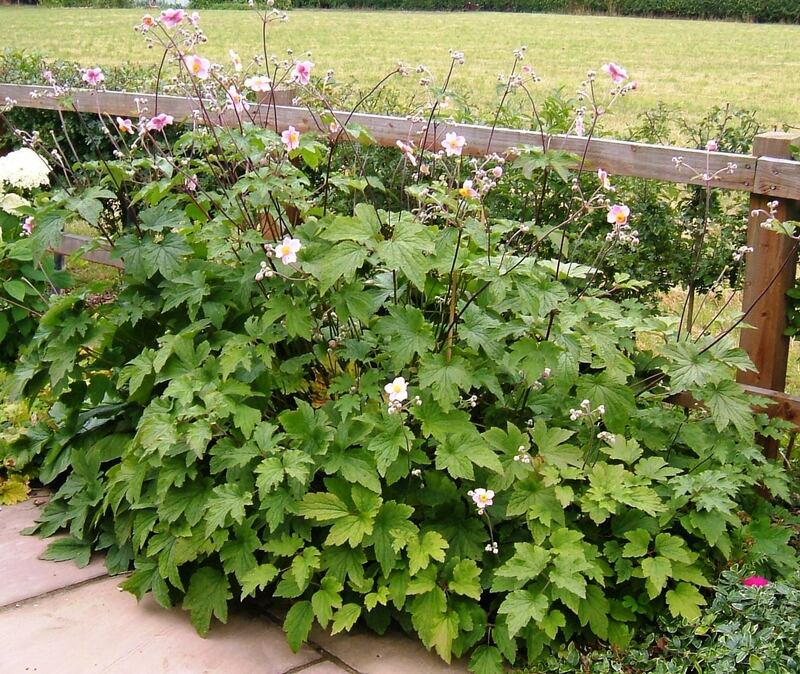 It is thought to be a natural hybrid between A. elegans, A. vitifolia and A. hupehensis..’. 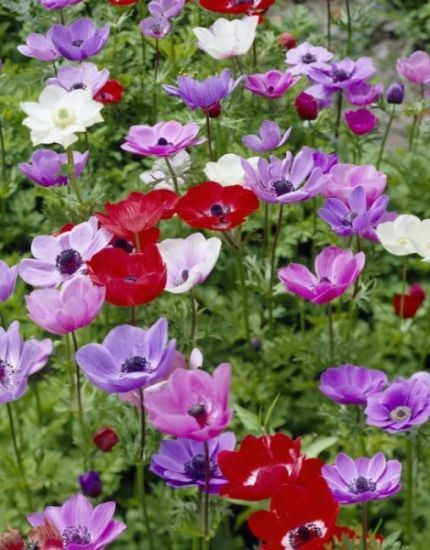 I have Anenome x Hybrida Tomentosa ‘Robustissima’ which is very vigorous. This was apparently a seedling raised by Lemoine in 1900. And finally, ‘..The elegant A. x hybrida ‘Honorine Jobert’ has neat, white flowers with a boss of golden-yellow stamens set round a green, pin-eyed centre..’. So what have I learned from these three plants in my small garden?